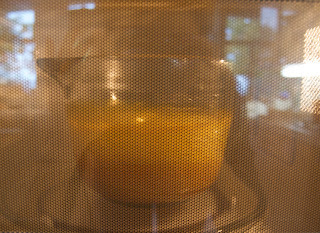 Tangerines and sugar, that's all it takes, add a food processor and a microwave and you have (almost) instant marmalade! 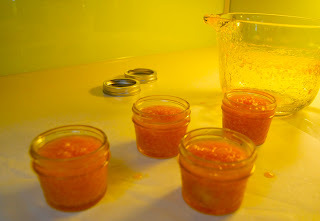 Beginners, if you are intimidated by marmalade this is a great recipe to try. Don’t get me wrong, I adore marmalade, but it is a lot of work. Just thinking about it, all the slicing, peeling and pith removal makes me tired. This time of year we all need a little extra time. 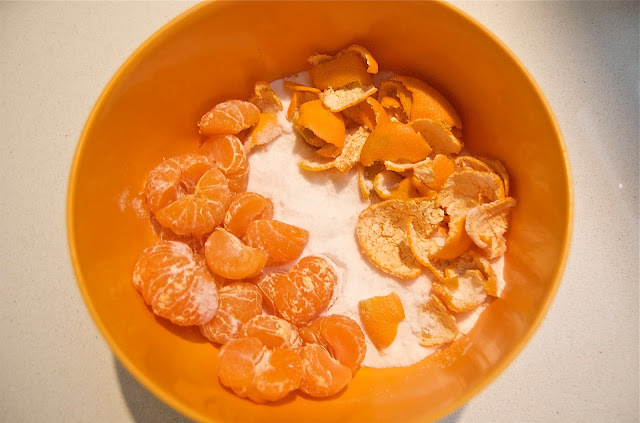 By utilizing the food processor and the microwave, start to finish, you can bang this out in thirty minutes, even faster if you use seedless tangerines and resist the urge to multi-task. Not as complex or refined as a traditional marmalade, it is fantastic nonetheless, and a great addition to every jammers repertoire. Some might consider it cheaters marmalade, but given the work/outcome ratio it’s a winner in my book. 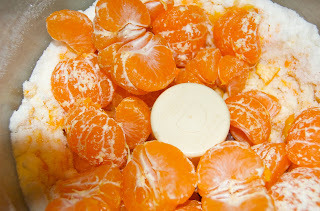 If you have a few extra tangerines lying around you can whip this up fast and seem like a star. Use the most flavorful tangerines you can find. Use a high-sided microwaveable container as the jam bubbles up. I like to use my 2-quart glass mixer bowl, which I can pour directly into the jars from. After you get the basic technique down feel free to play a bit adding a touch of booze or spices. Peel and seed tangerines (or get seedless) removing and discarding all the white stringy bits from the outside and down the center of the fruit. Place peel, pulp and sugar in the bowl of a food processor. Puree, making sure that all the peel and section skins are reduced to a pulp. It will be quite liquidly. Pour into a high-sided microwaveable bowl adding rum and nutmeg. Cover tightly with saran wrap that you have pierced a few times to vent. Microwave on high for 5 minutes. Stir; remove saran wrap and return to microwave for 7 minutes. Remove, stir and check thickness. At this point, depending on the juiciness of your fruit you may want to return it to the microwave for another 2-3 minutes. It continues thickening as it cools. Place jars in canner making sure the jars are submerged. Return to a boil and process 5 minutes (timed from the boil) for 4oz jars and 10 minutes for 8oz jars. Remove canner lid and wait 5 minutes before carefully removing jars. Place jars on towels or a cutting board to cool. Label and enjoy. Place almonds on plate and nuke uncovered at 100% for 5 minutes until golden. Combine sugar and water in a 2 qt glass measure. Stir thoroughly to dissolve. Cover tightly with saran. Cook at 100% for 4 minutes. Without taking measure from oven, uncover and continue cooking 4-5 min longer until golden. Do not stir. Remove from oven and stir in nuts. Quickly drop spoonfools on silpat. (I pour it all out and smooth into a single layer, then chunk when cool) If praline becomes too hard, return to oven uncovered, for one minute to soften. These are great as is or dipped in chocolate and a single batch never lasts very long. Had to share - love doing sugar things in the nuke! I know, when it works it's genius! I think one of the tricks is keeping the quantities small. I always want to double the recipe and it never works. I just did a batch with vanilla bean and rum. I was also thinking port might be nice with it. 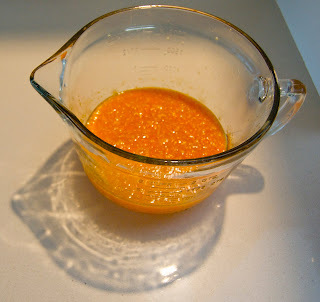 If you like microwave recipes try my quince paste,I was thrilled with the results. It's divine on a cheese plate. Yeah, I saw Kevin's recommendation for your nuked membrillo. I've been looking for quinces but here high in the Blue Ridge of sw VA they're hard to find in the markets although there are some varieties that'll grow here. Mmmmm, port. Did a dried fig jam with vanilla bean & port that took reserve champ at the county fair this year! Will try it with the marmalade and report back. Very Merry to You & Yours! I'm on a marmalade kick. Tangerines are languishing. I'm game for this recipe. Love the addition of rum and vanilla. Yums! If you are used to making marmelade, you will be amazed at how quick this! This looks great, but I don't have a scale. How many clementines would that be either by count or in cups? My guess is about 6-7 tangerines/pound, although this is not exact and of course varies by size desity etc... But it should do. Happy Canning! Hi Nina, I just made this (and posted about it, if you want to check it out) and it's just brilliant. What a great, fun way to spend twenty minutes! I'm sold. Thank you. Happy holidays! This made a wonderful gift, prepared and poured into a lovely candy jar. Thanks. Yeah! I live in an area where we have Satsuma Mandarins. I have a HUGE bag of them and was wondering what to do besides eat them as fast as I can. Thank you for the recipe. Will be trying out soon. Love your blog! Am a regular preserver of all things fruity. Welcome! I am going to post some more microwave recipes soon. Everyone seems to love them. this sounds lovely! we have a lug of tangerines...maybe by tonight we'll have marmalade, too! Can I use Splenda instead of sugar?? Unfortunately, it would not work. The sugar works with the natural pectin in the fruit to make it set. You might find some recipes with Slpenda using store bought pectin. I LOVE making jams and marmalades the old-fashioned way (just posted Satsuma and Meyer Lemon Marmalade), but I'll definitely give this a try when I'm between batches and need a fix! Love those cute little jars. The littler oven volume estimate alongside the shorter time for warming doesn't put as much warmth out into the kitchen.